Posts tagged with "Mountain Lion"
So, the next time you’re seeing general slowness on your Mac, don’t forget to give Launch Services a kick in the pants. Guaranteed to be more effective than zapping your PRAM. My MacBook Air was feeling slow -- especially when opening the Finder, clicking menubar items, and after waking up from sleep (at the login screen, I'd have to wait around 20 seconds for the keyboard to become responsive). It's much better thanks to Craig's tip. You can find the Terminal command here. After nearly four months in testing and thirteen betas seeded to developers, Apple has today released OS X Mountain Lion 10.8.3. As with previous software updates, the new version is available on both the Mac App Store and Apple’s website. 10.8.3 includes some new features and bug fixes. Notably, the update comes with the usual stability improvements, but, this time, also a fix for the notorious File:/// URL bug that could crash certain Mac apps. Safari 6.0.3 is also part of the update, with improvements for scrolling on Facebook.com, fixes for zoom, restoring position, and bookmarks issues that could cause bookmarks to be duplicated on iOS devices. As far as new features go, Boot Camp now comes with support for Windows 8 and Macs with a 3 TB hard drive. Introduced in late November 2012 with iTunes 11, Mac App Store gift cards can now be redeemed using a computer’s camera. In the past months, a few ways to enable AppleScript to display user notifications in Mountain Lion have surfaced online. Our own Don Southard wrote a test app using AppleScriptObjC; Ben Waldie put together an Automator action for Notification Center; terminal-notifier lets you send user notifications from the command line. Notifications Scripting (via MOSX Tumbelog) is a new entry in this scene, and it looks like a simple yet powerful addition that could be easily integrated into other AppleScripts. Notifications Scripting is a GUI-less application that can be only used with AppleScript. This application allows AppleScript scripts to display user notifications in OS X Mountain Lion and handle the user interactions with these notifications. The best part of Notifications Scripting is its dictionary. It contains definitions for the notification messages of course, but also for notifications that have been delivered and activated. In the code sample provided by the developers, a dialog is displayed in the Finder following a user notification. You can imagine how this tool could be integrated with scripts that prompt users for input or allow for multiple choices from a set of actions. You can download Notifications Scripting here. 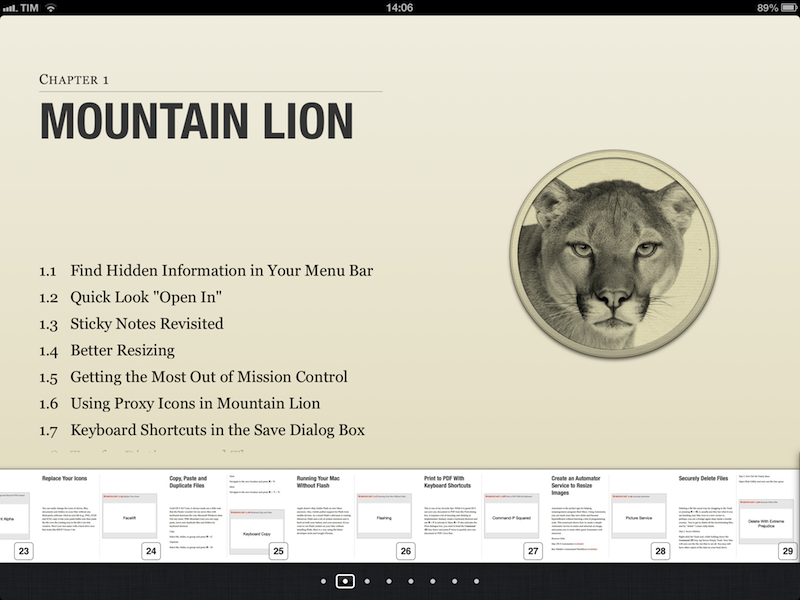 Published today, 60 Mountain Lion Tips is the latest entry in the MacSparky Field Guides series. Co-authored by Brett Terpstra and David Sparks, the book stands out for its clever use of iBooks 2.0 features (though a PDF version is also available) and embedded screencasts. There are 53 screencasts with 1.5 hours of video for a total of 60 tips organized in sections like Mountain Lion, Keyboard, Mail, and more. I was able to read the iBooks version on my iPad, and, as usual, everything's just great. I'm a big fan of David's screencasts (see here and here for examples), and the format of this new book makes for a quick consumption that, however, doesn't lack in depth. The tips are laid out clearly on the left side as text (assuming you're reading in landscape mode, which lets you see more of a page), and screencasts are available as video thumbnails on the right. Both text and video are clear, concise, and to-the-point. David and Brett do the voiceover, and the quality of the videos doesn't disappoint -- they are compressed, but not too much, so they're still pleasant to watch on the Retina display. The videos contain both voiceover and system audio, as well as on-screen tips for keyboard shortcuts and menus. The layout of the book is clean, and, like David's previous Field Guide, compliant with the design standards of iBooks Author. For instance, you can navigate from a page to a chapter by pinching out, you can access a dedicated page for notes and highlights, and you can watch videos inline. Similar to Push Pop Press' old physics engine, you can also "move" videos on the screen as they play. It's not that useful, but it's very cool. More importantly, 60 Mountain Lion Tips is easy to read and, in just a few hours, I actually got a lot out of it. We had our own Mountain Lion tips in our first eBook, and yet this book taught me a few OS X tricks I didn't know about. I especially appreciated the section on third-party app tips, which many roundups usually don't cover (we didn't). 60 Mountain Lion Tips is only $6.99. Check out the website here for more information and a link to the separate PDF purchase. 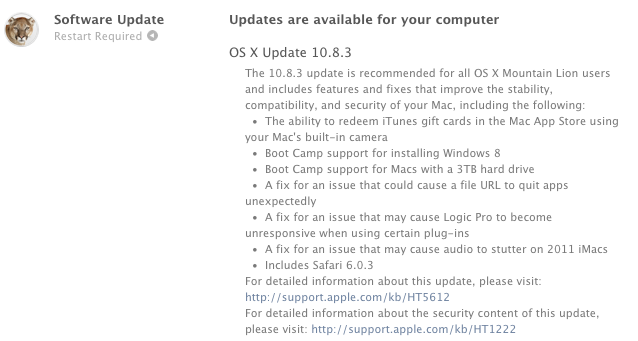 Following the release of iOS 6, Apple just pushed an update to OS X Mountain Lion as well, which reaches version 10.8.2. Available for download on the Mac App Store, 10.8.2 brings Facebook integration to OS X, working similarly to Facebook in iOS 6, and various stability improvements. Like in iOS 6, Facebook is now available as a social service to log in from the System Preferences, and there are options to update contact information and pictures through Facebook as well as system-wide sharing menus. On the feature set side, Facebook is now also integrated in Game Center (for friend recommendations and like buttons for games), Power Nap is now supported on the late 2010 MacBook Air, and iMessage introduces support for phone numbers alongside email addresses, just like on iOS 6. Apple just released OS X 10.8.1, maybe your Mac already told you via Notification Center, but Mountain Lion's first public update is out. The update includes general operating system fixes that improve the stability and compatibility of your Mac. The delta update appears to be less than 8MB is size. If you still haven't updated to OS X Mountain Lion, now would be an excellent time since the first 'bug fix' update is out. You can download it here via the Mac App Store. UPDATE: Apple has released the support document for the update with more details.You can find it here. Back in October 2011, we wrote about the release of Pixelmator 2.0, a hugely popular and award winning image editing application for the Mac. New features to version 2 gave us new drawing tools, shape settings, new heal and retouching tools, an improved type tool and more. Pixelmator was one of the first major success stories of the Mac App Store with $1,000,000 in sales for the first 20 days. 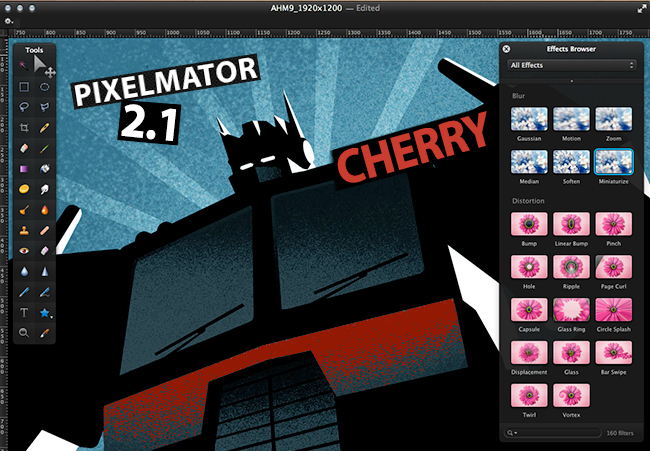 The retina-ready Pixelmator 2.1, code named Cherry, was released this morning with even more new features. Version 2.1 adds a new Effects Browser, several new effects like vintage and miniaturize, a new smart Alignment Guide system and more. Pixelmator has always been great at helping everyone access the benefits of image editing, said Saulius Dailide of the Pixelmator Team. And now, with all the amazing new features, as well as Retina Display, Mountain Lion and iCloud support and the app’s affordability, Pixelmator 2.1 is definitely the best way to tap into creativity. Retina-Ready: Pixelmator's friendly user interface is now fully Retina-ready. Built-in Support for iCloud: iCloud automatically stores images edited with Pixelmator and seamlessly makes them available on all of a user's Macs. New Effects Browser: The best and most enjoyable way to browse: instantly preview and quickly apply special effects and color adjustments to any image. Over 160 different breathtaking effects to play with. Tag and access favorite effects instantly in one place. Combine different effects for unique, near-effortless artistic creations. See stunning results in real time. New Effects Added: The new Vintage, Miniaturize, Black and White, Rain, and Snow effects help quickly transform any image into something dramatically unique. Smart Alignment Guides: The new smart Alignment Guides let users quickly position, align, and lay out objects evenly in Pixelmator compositions. Much more: Optimized image editing engine support for the new Retina display on the MacBook Pro. Built-in Mountain Lion sharing to iPhoto, Aperture, Facebook, Flickr, Airdrop – all right from Pixelmator. Easy way to access Color Adjustments from the Effects Browser. Enhanced to take advantage of the latest OS X Mountain Lion technologies. The new Effects Browser is slick; the palette works in a way that as you move your mouse over a selected effect, there's a vertical line that animates and shows the effect's intensity inside the Effects Browser. It's a lot like the way Apple does it with iPhoto groups and iMovie clips. There are some excellent effect presets in here too and they can all be combined to give you great results. The guides work a lot like InDesign CS6 in that they show centers, alignment measurements and more. The share menu works exactly as advertised and feels very much at home running on OS X Mountain Lion. iCloud support will be very handy for editing on multiple Macs, working on one machine then having the ability to reopen it on another. Version 2.1 runs very well on my 2007 iMac running Mountain Lion, I haven't had any issues. Pixelmator 2.1 is available exclusively from the Mac App Store for a limited-time price of $14.99, a great savings off the usual price of $59. It is also available as a free update for existing users who have purchased it from the Mac App Store. If you've been thinking about buying this great app, $14.99 is a great price and an excellent update to the already great app. 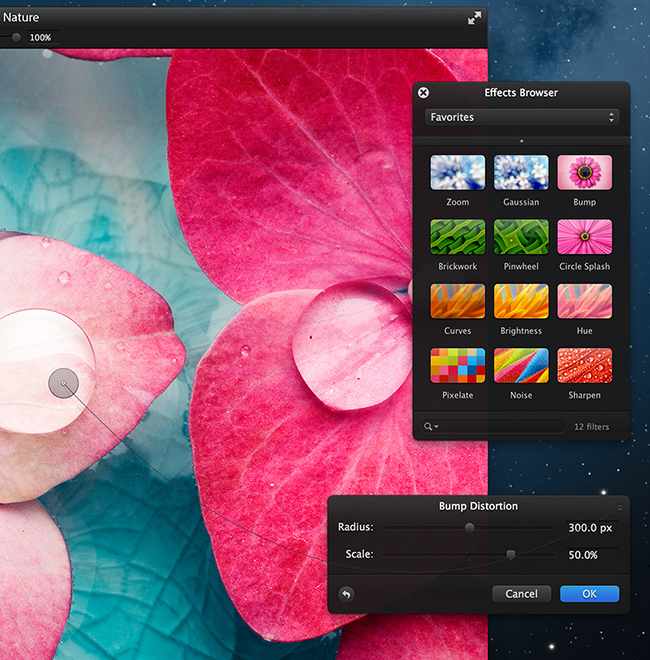 For more information on Pixelmator 2.1, head over to the Pixelmator website. If you want to be a better Pixelmator user, they have a wonderful tutorial site as well. Apple has released the open source components of OS X 10.8 Mountain Lion. As noted by Steve Troughton-Smith, they also include an example code of GameKit multiplayer on the Mac through the source code of Chess. Last week, Apple published a support document that provides more details on Power Nap, the technology Apple introduced with OS X Mountain Lion to manage certain updates even when a Mac is asleep. Firstly, Apple notes that, aside from the features explained on the OS X webpage and the System Preferences app, Power Nap also supports Spotlight Indexing and Help Center updates when a Mac is plugged into an AC outlet. The "other iCloud updates" mentioned in Power Nap's settings include Find My Mac, so you'll be able to track a Mac's location even with its lid closed; VPN connections (with certificates) for corporate email and configuration profile updates are supported as well.